The three volleyball serves we learn about in semi-private training and Boot Camp classes are the float serve which can be an underhand or overhand serve, the topspin and the jump serve. There are four types of volleyball serves most commonly used in advanced competition like high school games, college games, beach tournaments and national and international matches. 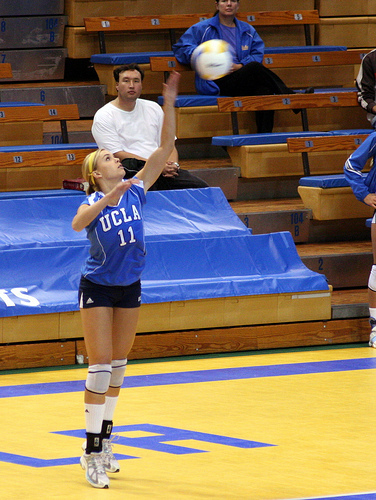 The underhand volleyball serve is used by beginners because its easier to control the ball. The sidearm serve is another form of underhand serve but when performed correctly can add more speed and pace to the ball making it harder for the receiving team to pass it to their setter. The overhand serve in volleyball requires you to toss the ball higher in the air before contacting it with an open hand above your head, like a tennis player uses a racket to contact the ball above their head. a flat-handed wide-fingered contact with the middle of the hand contacting the middle of the ball while keeping the elbow above the level of your ear. Friday night boot campers practice their serving arm motion at Friday Night Boot Camp class. The standing topspin serve requires a high toss, a high reach and quick armswing of the dominant arm with the hand contacting the top third of the ball, very similar to the spike contact. Contacting the top third of the ball creates the forward motion which launches the ball with alot of spin, pace and speed from your service line to the opposing court. This high paced fast traveling serve is used to make it extremely difficult for the passers to receive the serve and get it to the target. The jump serve has two versions of the overhand serve, the jump float and jump topspin serve. The jump float and the jump spin serves can be described essentially as spike attacks taken from behind the service line into the opposing team's court. The ball is contacted with your dominant hand or any part of your arm with the intent of creating enough force to send the ball over the net and inside the opposing team's court. Left handers do the opposite. How you contact the ball to send it over the net depends on the type of serve you decide to use. Before leaving this page Say "Hi" to Miss Tattoo the Tiger wearing the #9 jersey below. Miss Tattoo is the starting defensive and serving specialist for the All Beast VolleyBragSwag All Star team.